I am so excited about this project! I first saw a chandelier made out of hangers about a month ago in a store window downtown and thought it was crystal. On close inspection, it was made out of clear acrylic hangers. I went home and looked on the Internet for more design and found all kinds of designs–all made of simple coat hangers in different arrangements. Of course I had to try to make one myself! Preferably using free materials. The result is what you see above: a chandelier made out of one bicycle rim from my dumpster-diving adventure, twenty-six black hangers from Macy’s trash, and some wire. The video below shows how I put it all together. In the feature photo, the chandelier is wrapped around a light fixture in our entry-way. To give it something to rest on, I tied a bicycle break rotor to the light fixture, then simply wrapped the top of the hangers around the rotor and tightened the wire tie. 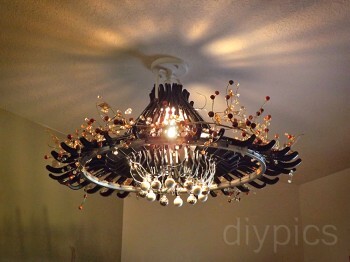 The fun thing about this chandelier is that you can decorate it in different styles. The photo shows a fall color bead wreath wrapped around the outer edge of the chandelier and silver Christmas ornaments hung from the hooks. The light source is a single bulb in the light fixture. Today I changed all of that out for a string of tiny Christmas lights plugged into a socket adapter (where the light bulb would go). I wrapped the tiny lights around the inner hooks and the outer edge of the chandelier. It’s spectacular! So, if you live anywhere near a Macy’s, please go get some hangers and make yourself an elegant holiday chandelier. It’ll be the talk of any party you have in your home! And it’ll be one more way Macy’s brightens up your Christmas! Check out more upcycled lamp projects in my post DIY Upcycled Table Lamps and More. Awesome!!!! Cant wait try this out with my husband!! No better compliment! I’d love to see a picture of your completed chandelier. You can post it on my Facebook.